Pass your B+E trailer test in one day! Do you need to tow a trailer for business or leisure? Caravan, Horsebox, Boat or Plant and Machinery? Our customers include Market Traders, Catering Trailer Businesses, Tree surgeons, Park rangers, Landscape gardeners, Builders, Joiners, Horse Riders, Mechanics, Sailers, Power Boaters, Out Door Education and Adventure Instructors and Helicopter Pilots.. If you passed your car driving test between the 1st of January 1997 and 19th January 2013 you will have been issued a category B driving licence. This licence allows you to tow a small trailer 750KG behind a car 3500KG. Or a combination of car and trailer which weighs upto 3500KG provided certain conditions are met. Many combinations of towing vehicle and trailer exceed these limits and cannot be driven on a category B driving licence, such as a caravan, horse box or broken down car. If you passed your car driving test after 19th January 2013 the restrictions on what you can tow have been increased. In order to tow a heavy trailer with a car or van you must sit a further practical driving test, there is no theory test required. The BE or B+E driving test follows the same format as the vocational LGV HGV PCV driving tests. These tests are carried out at Livingston LGV test centre. Our patient instructors are fully qualified to provide car and trailer training. We have a towing vehicle and trailer which meets the DSA minimum test vehicle requirements and can provide full training to pass the B+E driving test. We also offer reversing courses and advanced towing courses for those who passed prior to 1997 and already hold B+E but might have never actually towed a trailer, or simply need guidance. Please be aware that most candidates who are unsuccessful at the B+E test fail due to their general forward driving, not the reverse exercise. The standard of driving required is much higher than that of the standard learner car test. Training is available 7 days per week from 0700 to 2200 subject to day light. We have provided car and trailer training to customers from around the UK including drivers from Carlisle, Dumfries, Newcastle, Inverness, London, Dunbar, Fife Bristol, Liverpool, Manchester, Skye, Aberdeen, Edinburgh, Glasgow, Fort William, Stirling and Perth. Our past customers include the Scottish Prison Service, University of Edinburgh, Heriot Watt University Edinburgh, Crummock, RUTS, FMS Scotland, Mike Stoane lighting, Stoats Porridge, Royal Yachting Association, St Andrews University, Arniston Estate, Tennant Company, Adwelding, Go Ape!, ITEC, Edinburgh Napier University. Mark passed with just one minor driving fault! Neil Passed with a Clean Sheet! Stephen passed first time with only 2 minors! Emma was the first to pass in our new yellow yeti. Niklas passed with 2 minors. Callum passed and is away to shear sheep around the world! Julia Passed first time and is now towing horses. We provide the towing vehicle and trailer and can arrange your DSA practical test, all you need do is turn up with your driving licence, we do the rest. Pass your trailer test in just one day! We can customise a course to meet your specific requirements contact us for a quote. As with our other training courses tuition is normally provided on a 1:1 basis, we can accommodate 2:1 if required by the client. Please ensure you have both parts of your full driving licence available prior to booking training. B+E trailer training is normally carried out in West Lothian from our vocational vehicle operating base in Tarbrax EH55. We cover the following test centres for B+E test centres: Livingston LGV, Glasgow*, Perth*, Berwick upon Tweed*, Kilmarnock*. *tests at centres other than Livingston will attract a vehicle positioning fee. Before parting with your hard earned cash it is worth checking the qualifications of your trainer! Anyone who passed the car test prior to 1997 could present themselves as a B+E trainer and charge money for training without having any qualifications or experience at all. They may never have actually passed a trailer test themselves. Our Business is Driven by our Customers! Jonathan is a great instructor, he was always on time, patient and good at explaining what was required. I would reccommend him to anyone wanting to do the vocational B+E test or indeed undertake thier inital driver training. Spent 4 hrs with Johnathan and then passed a B+E test first time with flying colours. Would recommend Bananas Driver Training. To anyone if they are considering to learn to drive. Johnathan was friendly, and generally was a great instructer. Jonathan went well above and beyond the call of duty by clearing the snow and ice from the test center reversing area to allow my test to go ahead. His clear instruction made the whole process very straight forward. Many thanks for getting me through my B+E car and trailer test. 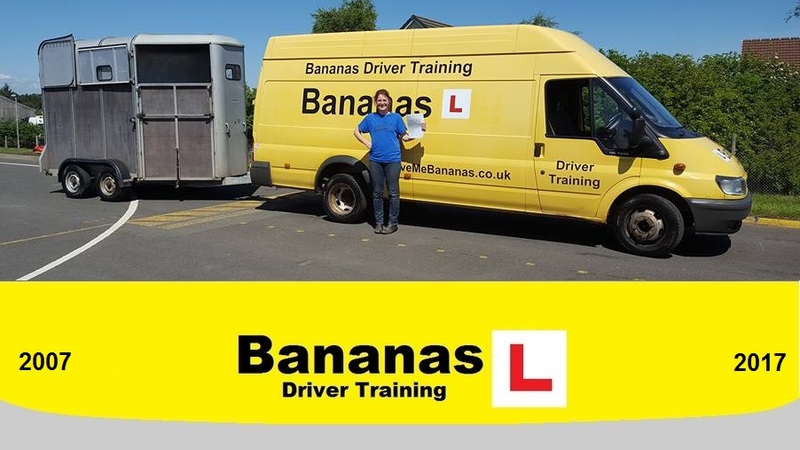 I used drive me bananas to get trailer lessons sit my trailer test, very good service and a nice unintimidating car and trailer setup do it all in. Go Bananas Driver Trainng, Driving Me Bananas Driving School, Driven Bananas.